A damage cap limits the total amount of non-economic damages that plaintiffs can be awarded for a case. These caps are set by legislators, usually on a state-by-state basis. The federal government has also put a $250,000 on the total non-economic damages that plaintiffs can be awarded in medical malpractice cases. Damage caps cover non-pecuniary harms — that is, damages that do not have a direct economic consequence to the plaintiff, such as loss of enjoyment of life, pain and suffering, trauma, paralysis, loss of a limb, disfigurement, grief after losing a family member, and other permanent disabilities. While these harms can seriously effect a plaintiff’s quality of life, quantifying them in monetary terms can be a complicated issue. Pecuniary harms, also called economic damages, include such quantifiable expenses as medical bills, lost future income, and lost wages. Damage caps typically do not apply to pecuniary harms. Washington state does not place caps on non-economic damages. 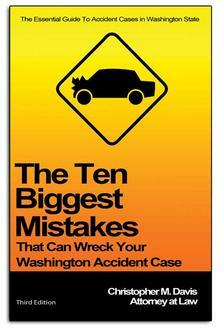 Washington’s state courts have held that these limits on non-economic damages are unconstitutional. Washington does, however, limit certain types of damages that plaintiffs can be awarded. Unlike most of the other states in America, Washington does not allow courts to award punitive damages. Punitive damages are an additional amount of money that can be added to the damages that a plaintiff is rewarded in a civil judgement. While damages are normally intended to compensate a victim for his or her loss, punitive damages are intended as punishment for an individual or company. Punitive damages are awarded when the behavior of the defendant is considered especially harmful — for instance, if they were warned repeatedly about a safety hazard without acting, or if they released a product knowing that it was likely to be harmful. The main types of damages that we talk about when it comes to personal injury claims are "economic damages" and "non-economic damages." These are the most relevant types of damages that we deal with when it comes to cases that go to trial in Washington state because "punitive damages" are not allowed in our state. The term "punitive damages" refers to a special kind of monetary award that goes beyond what is required to make the plaintiff or victim whole again. In other words, a jury verdict that involves punitive damages is typically significantly higher than one might expect to be adequate compensation for the plaintiff. READ: Should Washington State Allow Punitive Damages for Outrageous Conduct? Punitive damages, also called exemplary damages, are meant to serve as punishment to the responsible party. Juries often award punitive damages involving extreme examples of negligence, fraud, or a combination of other types of egregious conduct. In certain cases, punitive damages can add millions or even tens of millions of dollars to the amount that a plaintiff is awarded. When you see a personal injury case in the news involving a judgement of tens of millions of dollars, punitive damages are often involved. Because Davis Law Group, P.S., operates in Washington state, we often speak with injured people who are confused about what their cases are worth and why they see such high damages awarded to similar plaintiffs in other states. The truth of the matter is that civil injury cases are complex, and the laws that limit these different types of damages differ from state to state. Entirely different considerations apply to certain types of cases involving federal laws, like the Jones Act. When you speak to a lawyer about your personal injury case, don’t assume that a news story you read about a similar case in a different state means that you stand to collect exactly the same amount for your injuries.